The CBS board member's email urging Kathy Griffin to apologize to Trump is outrageous and unsurprising. Kathy Griffin posed for a photo with a model of Trump’s decapitated head three months ago—in Trump presidency time, that’s about seven years—but it might as well have happened yesterday. 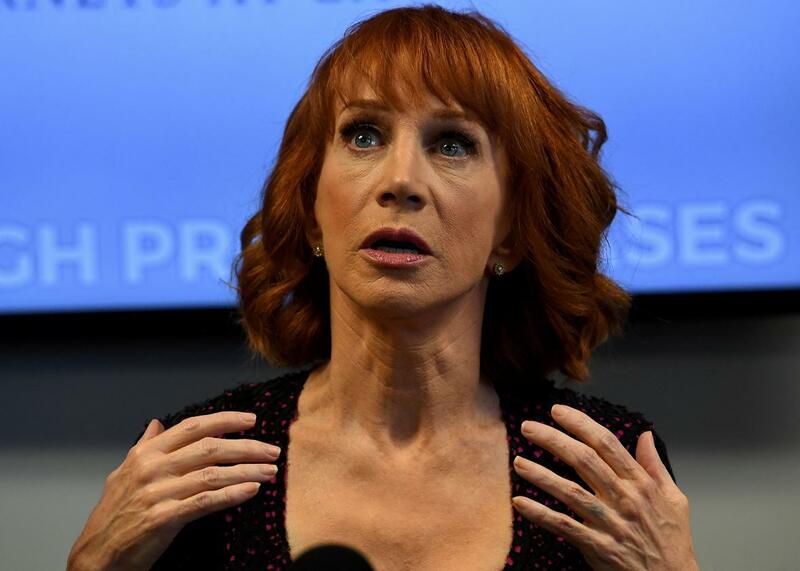 A new New York magazine piece on Griffin finds her struggling to get work, still fielding new death threats, and distancing herself from friends like Anderson Cooper who she says didn’t check in with her for months, even as she was being dragged in both the left- and right-wing press. That line was probably Griffin’s first indication that Kopelson’s suggestion was some nonsense. Trump has about as much experience with compassion as Steve Bannon has with unconscious bias training. Would the man who defamed a mother who lost her son in an American war accept an apology from a loud-mouthed left-wing comedian? Trump doesn’t have a gracious sweat gland on his body: He sees apologies not as opportunities for forgiveness, but as weak points waiting to be pummeled over and over again. For Griffin, an outspoken progressive and dedicated follower of politics, sending this letter would have meant peeing all over her most cherished values for the slim possibility of getting on the good side of a man she believes to be a cruel demagogue. Sure, her photo was a tasteless bit of shock comedy that looked more like a shallow publicity grab gone awry than any kind of pointed political commentary. But she was quick to apologize, and unlike other comedians who’ve earned widespread public ire (see: Michael Richards and the N-word) her target was a politician, not a marginalized or oppressed population. Comedians are not known for debasing themselves at the feet of the powerful after an (admittedly bad) joke lands the wrong way, especially if the target of the bad joke is a public, privileged figure. The suggestion that Griffin besmirch her own political comrades, affirm Trump’s routine incitement of violence against the media, and praise some imaginary set of good deeds he’s done is unbelievably cynical. It assumes that Griffin would gladly sell her soul for the chance to maybe make more money. Griffin told Ali that Kopelson is just another one of those “men who control the checkbooks” in Hollywood, who are quick to trade in any semblance of liberal values for the security of their business interests. She and Ali make all kinds of good arguments in her defense that should seem obvious: The Trump family’s personal attack on a second-tier entertainer was unprecedented and wrong; Trump himself has championed those who’ve advocated for the actual assassination of his political opponents; Trump is doing far worse concrete damage than Griffin, and she’s not the president, so why should she be forced to kiss his ring to get back in the industry’s good graces? It all points to one very unflattering truth about the entertainment industry. No surprise here: Despite the supes empowering storylines, nice platitudes about equality, and resistance-baiting tweets, money, not any notion of right and wrong, is the guiding light. Griffin says she’s gotten lots of sympathetic messages of support from fellow industry folks; none agreed to speak with Ali for his story. Surely none of them think Griffin was truly threatening an attack on Trump, and most probably feel that her subsequent career tailspin was undeserved, but none were willing to associate themselves with someone who’d angered a president every moral person believes is a stain on humanity. Trump can bully his critics for their bad jokes all he wants, but his overblown attacks only gain power when everyone else agrees to play by his messed-up rules.